As seen on my Instagram account, I decided to stuff chocolate chip cookies with nutella last night after my success with nutella muddy buddies. Results were delicious! I used a brand new chocolate chip cookie recipe from Thomas Keller's Ad Home At Home. I don't know why I haven't tried more dessert recipes from this book as the pie crust is still my go to for numerous occasions. This cookie may have bumped my "best" chocolate chip cookie for the last 6 months to second place. 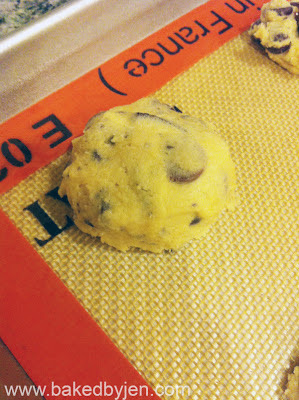 Process was a bit cumbersome as you have to do twice the work for one cookie. I started with 1 tablespoon of cookie dough which I flattened out to fit the teaspoon of nutella. Then, I added another semi-flat tablespoon of cookie dough on top. I sealed the edges together and slightly rolled it into a ball shape. 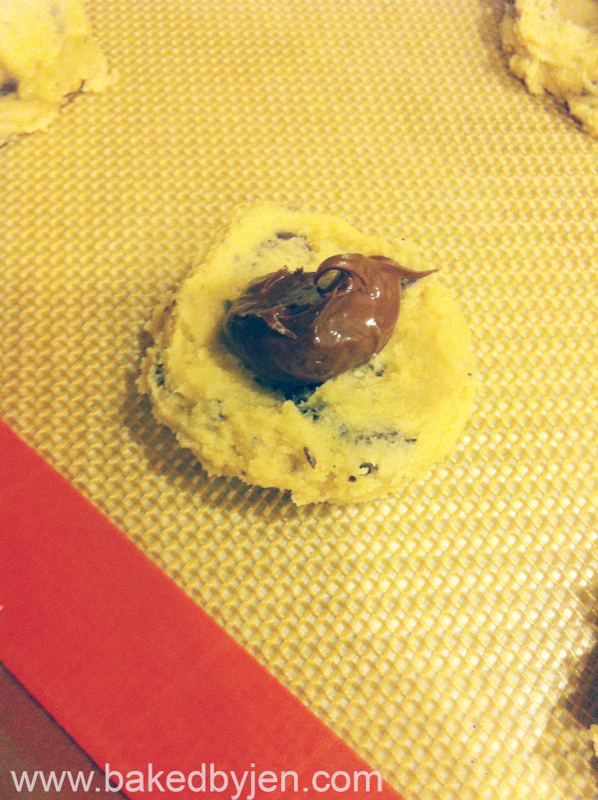 The amount of chocolate chips in this recipe did almost make the amount of nutella nonexistent. I would recommend cutting back on the chips if you want the nutella to come through. Want to know how to make a cheesecake taste even more rich? Add white chocolate to your batter! 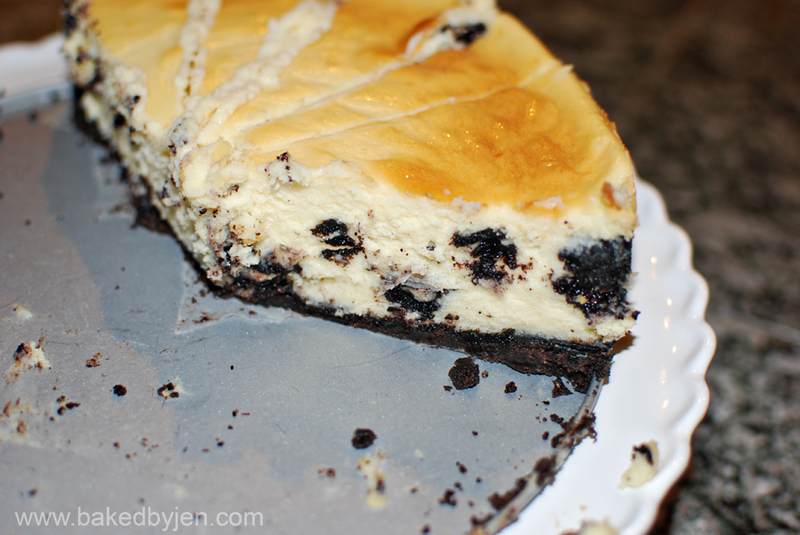 Inspired by the Starbucks White Chocolate Peppermint Mocha drink, I decided to turn the house favorite Oreo Cheesecake into the perfect holiday treat for our dinner guests this past weekend. I followed the white chocolate and raspberry swirl cheesecake recipe from Junior's Cheesecake Cookbook but eliminated the raspberry swirl for 8 chopped Trader Joe's Candy Cane Joe-Joes. Also, the crust was made with the chocolate peppermint cookies. Preheat oven to 350F. Place the cookies in a ziploc bag. Flatten, remove excess air, and seal. Roll a rolling pin over the bag until you have finely crushed crumbs. Place crumbs in a bowl and mix in the melted butter. Press firmly into a 9-in springform pan. Bake for 8-10 minutes. Remove from the oven and let cool on a wire rack as you proceed with cheesecake recipe. I am pretty sure I have gained 10 pounds this month alone; I am afraid to step on the scale at this point. 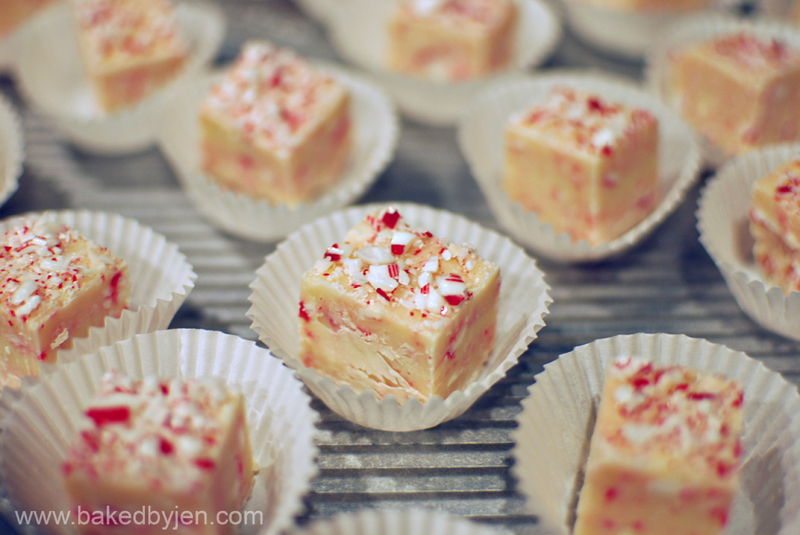 The last few weeks, I have been baking up all sorts of holiday sweets for family, friends, coworkers, from the tried and true to something new, like this white chocolate peppermint fudge. I've included the recipe; however, I would increase the amount of extract to at least 1 teaspoon the next time I make it. The peppermint flavor was very subtle. Line an 8-inch square baking pan with aluminum foil. Combine the chips and sweetened condensed milk in a saucepan over medium heat. Stir frequently until almost melted, remove from heat and continue to stir until smooth. 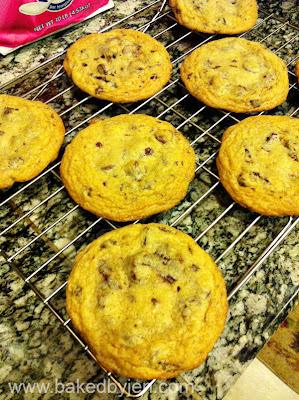 When the chips are completed melted, stir in the extract and the crushed candy canes, reserving 1/4 cup. Spread mixture evenly in the bottom of the prepared pan. Sprinkle remaining crushed candy canes over the top. Chill for 2 hours, then cut into 1 inch squares. 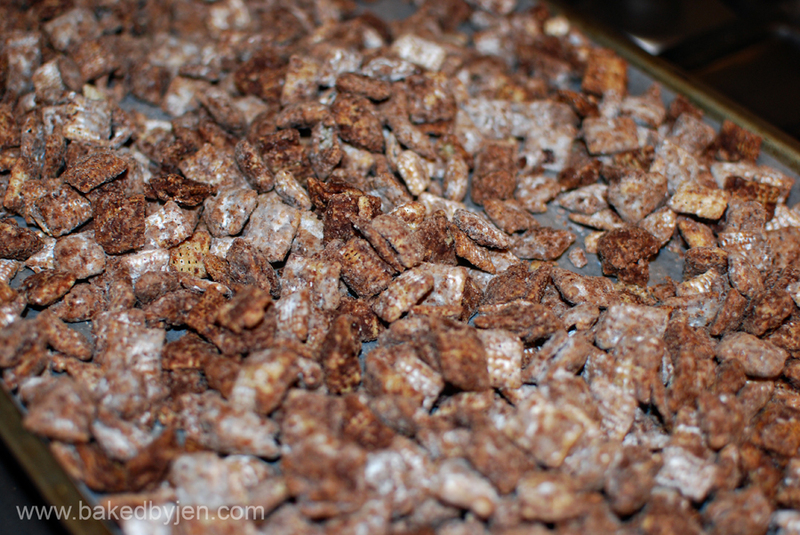 I've seen several versions of Muddy Buddies also known as Puppy Chow floating around the blogosphere and I had every intention to keep to the basics but we happened to pick up a jar of nutella recently. So, I thought what if I substitute nutella for peanut butter and it was the best decision yet. In a large bowl, measure out the cereal and set aside. In a microwavable bowl, microwave chocolate chips and butter uncovered on High for 1 minute; stir. 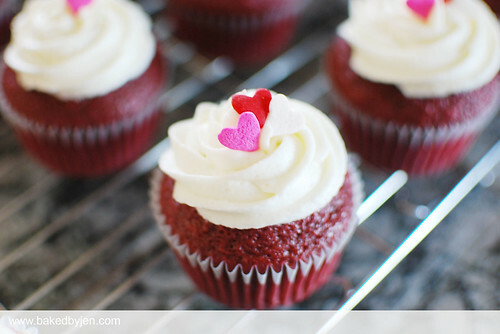 Microwave about 30 seconds longer or until mixture is stirable. Stir in the nutella. Stir in the vanilla. Pour mixture over cereal, stirring until evenly coated. Pour into a 2 gallon resealable food storage plastic bag. Add powdered sugar by the 1/2 cup. Seal bag each time and shake until well coated. Spread on a waxed paper lined sheet pan to cool.